When it comes to strength training, many people enjoy using elastic rubber bands as a form of resistance. As is commonly known, strength training is vital to any fitness program. Any form of resistance training has multiple benefits for increasing strength and development in muscles. When compared to free weights or training with machines, it can be asked whether training with rubber bands is just as effective and what the advantages are. Elastic bands can offer resistance through several different angles and areas of motion. Since elastic bands do not depend on gravity to provide resistance, they offer movement which dumbbells do not. Elastic band training is also extremely versatile. When you train on a machine, you are only able to perform one or a few exercises. However, with elastic bands, you can perform various different exercises for different body parts. Elastic bands are affordable and easy to carry around in a sports bag. You can also pack them in your suitcase and travel with them. Research has shown that resistance training with elastic bands is exceptionally beneficial for older men and women. As little injury can occur and there isn’t too much pressure placed on joints, this is a safe and effective way to provide them with the same benefits as free weights. However, with proper instruction and slow progression, older individuals can also benefit from training with weights. 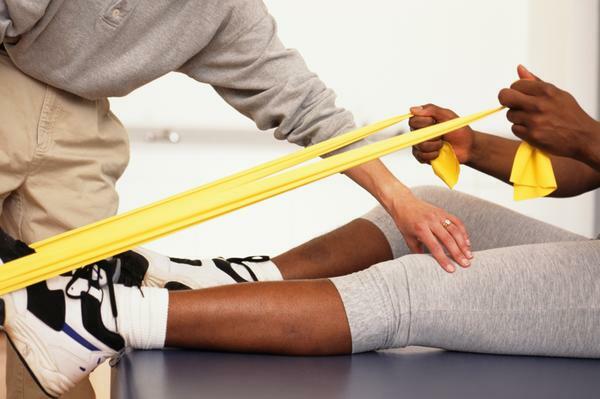 Elastic bands are also used in rehabilitation centers or for individuals nursing injuries. Many athletes and sports centers are also known to incorporate training with elastic bands into programs. One of the drawbacks of training with rubber bands is that they can break easily, and must always be inspected to ensure they are still safe to use. When training with elastic bands, your progress is limited and you cannot easily keep track of your improvement. When training with weights, your progress will be easy to quantify. You can keep track of the weight you are carrying and slowly increase the weight to progress even further. Although there are bands that offer different levels of resistance, it is still not equal to the precision of progressing with free weights. Dumbbells range from light to extremely heavy and can offer progress in small or large dosages, depending on your goal and fitness levels. The biggest disadvantage in training with elastic bands is that they are not as effective as training with weights for increasing muscle size and strength. Most bodybuilders and athletes train with free weights as they help them progress more and achieve their goals faster. If your primary goal is to achieve muscle mass or a change in your physical appearance, then training with free weights should be your primary focus. Although it is easy to train with elastic bands at home or travel with them, research has also shown that training with your bodyweight is actually more effective. This is not to say that one should abandon resistance training with rubber bands. Incorporating exercises using elastic bands into a program can offer variety and new exercises for the muscles. Using elastic bands is also extremely useful for beginners who wish to start lightly in a resistance training program. Training with elastic bands should be used in combination with free weights for optimal results. It is not advisable for anyone to solely train with rubber bands unless they are injured or have medical conditions.